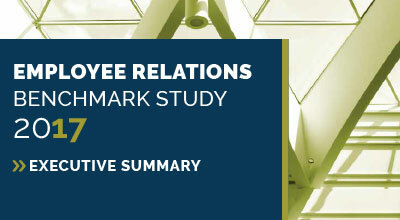 Get in the know with the latest employee relations insights. In this study, you’ll find the most current and robust data on organizational models, staffing ratios, case management, issue trends, and more. We’ve heard from over 100 enterprise organizations to gather the latest intel on employee relations. For every 1,000 employees, organizations will receive around 7.34 allegations of discrimination or harassment — almost double what it was last year. Since last year, a third of organizations saw a significant increase in issues, and caseloads per practitioner have increased dramatically. Organizations with centralized ER models use around 32 percent less ER and HRBP resources than those with decentralized models. Download the "2017 HR Acuity Employee Relations Benchmark Study: Executive Summary" today!